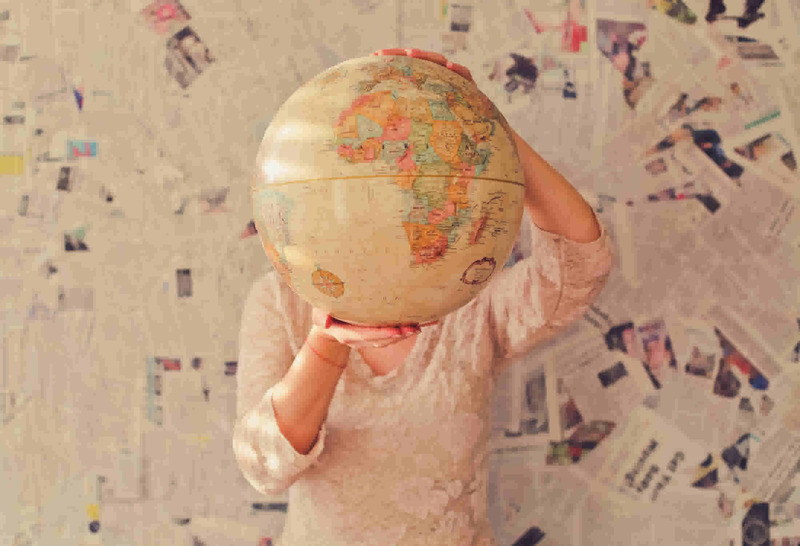 Reaching an international audience means having international content. Having your content available in multiple languages is great for maximizing your potential audience. On top of that, ensuring your multilingual site’s content is easy to edit is especially important, to enable translators without development experience to work effectively and reduce the incidence of translation errors. In this post, I will explore how to set up a Jekyll site to support multiple languages, and use Forestry to provide an interface for creating translations. Jekyll doesn’t have support for multi-language sites baked in, but there are many solutions out there that can make it happen. For this post, I wanted to find a solution that was simple to understand and didn’t require any plugins. My favorite solution came from this blog post by Anthony Granger. His strategy involves having a separate path for each language’s content, and using a couple front matter values to tie things together. I used Google Translate for the Spanish content. No me odies. The key to this strategy lies in the use of front matter. We are using the lang key to identify the language that this post is in, and another key called lang-ref. lang-ref will store a string that uniquely identifies this post. When we create a translation of a post, we should use the same value for lang-ref so that we can link both translations together. The lang-ref value will identify the two translations as having the same content. title: ¡Bienvenido a mi blog! Another way to link posts together would be by keeping their filenames the same, but using lang-ref allows us to use different filenames, and thus translate our URLs as well as the content. To display alternate translation options for each post, I created a file at _includes/footer.html and included it in the default layout. We can use this same loop in _includes/head.html to include link tags denoting the alternate versions of the current page. This will help search engines accurately index your site. There are a couple more things I want to add to improve the experience of using this site. First, I want to display the full name of the language instead of just the language code in our navigation. Second, there are elements of our layout that I have hard-coded in English. We should be translating that stuff too! For the first part, I’ve added a languages.yml file in the _data/ directory to add metadata to our supported languages. For each language code, I’ve added the full name of the language and an emoji of a corresponding flag. Our language selector looks much nicer now! To translate text used in layout files, I’m using a translations.yml file to store translations of arbitrary text that we might want to use in our layouts. Our translations file organizes translations by a specified identifier, as opposed to looking them up based on an English phrase. This allows us to change the English text as well as the translations without breaking anything. en: "Read this page in a different language"
es: "Lea esta página en un idioma diferente"
One issue we run into with adapting the Hyde theme is that any time a list of posts or pages is created, it includes content across all of our available languages. Ideally, we will only show content whose lang attribute matches the current language. We’ve swapped out the original for post in site.related_posts for a different structure that uses the where filter to only include posts that have the same language as the current page. Since we put all of our english content inside of /en/, when a user visits the homepage, the site doesn’t know which language to display. We can address this by adding a splash page to the homepage where a user can select their language. The splash page loops over the languages defined in _data/languages.yml and displays a link to the section. Forestry’s UI for static sites can significantly streamline the editing experience for your translators, and help them make the right decisions. We’re going to take advantage of Forestry’s configurable sidebar to help our translators add their content correctly. To access the sidebar configuration, click on Settings in the sidebar and navigate to the Sidebar tab. You can add, edit, and remove sidebar sections here. After first importing our site, we are faced with a default configuration for our posts and pages. We will be removing these and replacing them with our language-scoped sections. Once the existing sections are removed, we can click Add Section to open the section creation modal. All of our sections will be of type directory. For our English posts, we can use a label of English - Posts. Under path, we will enter the path to our content. In this case, we will enter en/_posts to only display content located in that directory. The match option takes a glob which can be used to filter which files and subdirectories are identified as content. For our purposes the default of **/* will work fine to match everything in this directory. We can use the default values for create, new file extension, and available templates. 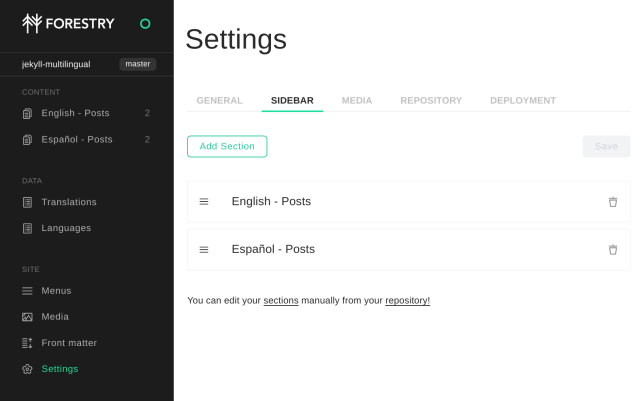 Check out the documentation on sidebar configuration to learn more about what these do. Once our English section is created, we can do the same for Spanish. Create a new section and set the path to es/_posts and the label to Español - Posts. We now have a customized editing experience for editors and translators! Creating an effective multilingual site can be challenging, but using static sites and Forestry’s UI can go a long way to making the translation process as streamlined as possible. I highly recommend you experiment with what’s possible using custom paths and Forestry’s configurable content sections! Next week: We'll take a look at VuePress, a static site generator built with Vue. Last week: We discussed why we like storing content in Git.